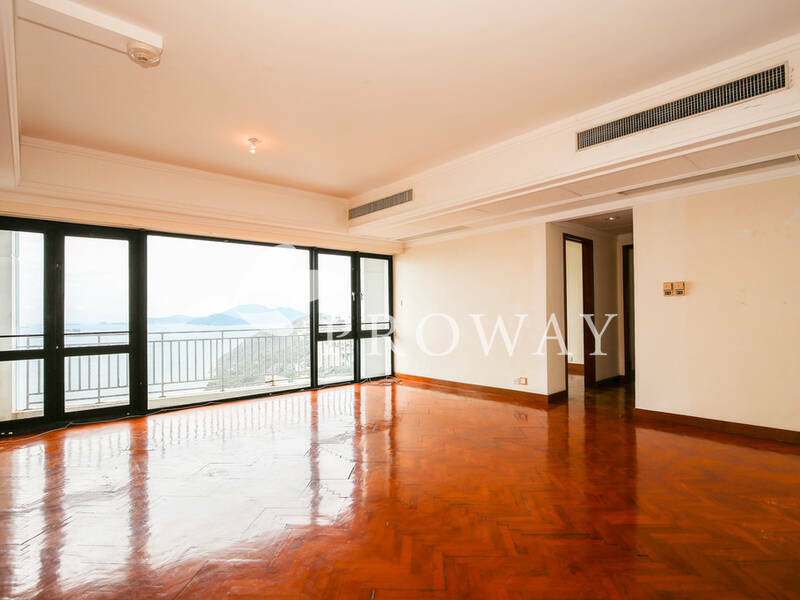 Gorgeous views overlooking the renowned Repulse Bay Beach and the sea from the front windows. Serene green views onto the mountain while looking down onto the clubhouse from the rear window. Prestigious apartment with central air-con, off white painted walls and elegant mahogany wooden flooring. Spacious combined living and dining room fronted by wall-to-wall windows leading to a balcony, and a rear window facilitating air circulation. Master bedroom can accommodate a queen-size bed and is attached to a walk-in closet and ensuite bathroom that features bathtub, glass shower cubicle and under basin cabinets. Other two bedrooms can fit double beds or study sets. Second bedroom contains a built-in wardrobe. Lots of cabinets along with built-in essential appliances such as fridge, oven, microwave, range hob, exhaust hood and dishwasher complete the modern kitchen. Guest bathroom includes a bathtub. Separate washer and dryer in the generous utility room. Maid's room can fit a single bed with extra space for cabinets. Scenic balcony is accessed from the living and dining room. Residents enjoy clubhouse facilities and shuttle service. Taggert tower contains 63 apartments, 5 of which are duplexes. They range in size from 1,585 to 4,378 sq. ft.